Mission statements are required part of non-profit organizations, but I’ve often found that they’re treated like death and taxes–inevitable but you don’t want to think about it. In museums and historic sites, you can tell when they’re particularly useless when you can swap the name of the organization with another and it still makes sense. Good mission statements are distinctive, memorable, and passionate. They have to help you make decisions–is this project, activity, donor, or partnership right for us? They have to go beyond “collect, preserve, and interpret” and describe what you want your audience to “think, feel, and do“. Creating a good mission statement isn’t easy and examples are hard to come by, so when I find them, I collect them like golden eggs. Montpelier's new mission statement on the back of a business card. 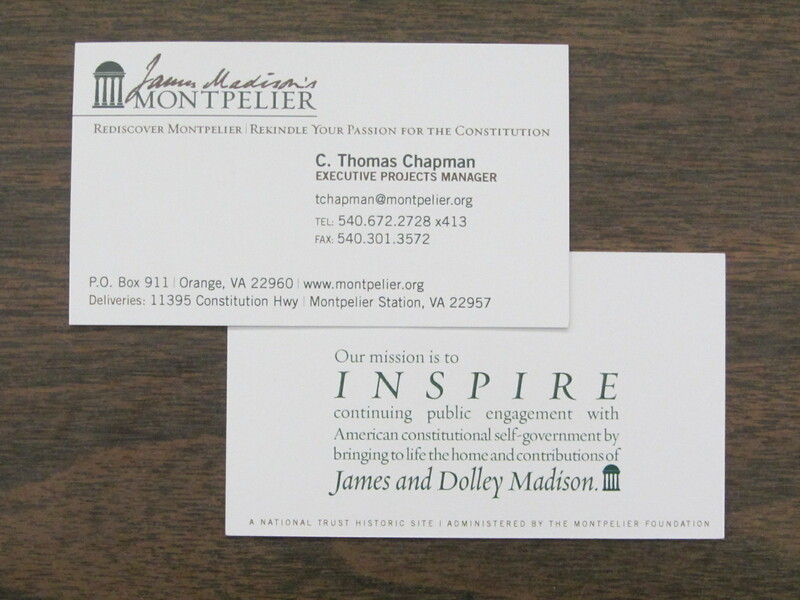 Our mission is to inspire continuing public engagement with American constitutional self-government by bringing to life the home and contributions of James and Dolley Madison. brought about its creation and ratification. Yikes. Try to fit that on the back of a business card. This entry was posted in Governance and management and tagged James Madison's Montpelier, Mission statements on December 5, 2011 by Max van Balgooy.